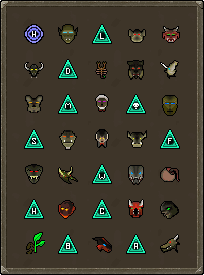 The necromancy spellbook is receiving a bit of love this week, including the addition of 11 teleports and the brand new resurrect crops spell! Resurrect crops is a new level 78 spell on the necromancy spellbook which gives you one 50 - 75% chance to bring a farming patch which has died back to life. The chance of the spell succeeding is dependent on your Magic level, starting with a 50% chance at 78 Magic and scaling up to a 75% chance at 99 Magic. Please note: If you had dead herbs in a patch before the release of today's update the resurrect crops spell will not be able to resurrect your herbs. When you cast the spell it will simply clear the patch. Once the patch has been cleared and new herbs planted it will then function as expected. Teleport scrolls have been given a new, unique teleport animation to make them stand out a little more. It is now possible to choose whether or not boss killcount messages are filtered out by the game message filter. You can toggle this by right-clicking the game filter button at the bottom left of your chatbox and selecting 'configure'. Dense essence rocks are now a much darker shade of grey when depleted. Increased the click-zone of all mining rocks. The first poll of 2016 now correctly states that it ran in 2016 rather than 2015. A few typos in the examine messages of NPCs on Zeah have been corrected. Brutal arrows have had their examine messages corrected. Hatius Cosaintus now correctly states that the new shortcut goes under the Draynor village wall rather than over. A missing space in Nickolaus' dialogue has been added. The Key master in Cerberus' lair now refers to Arceuus rather than Archeus. Millie Miller's dialogue has had a few issues resolved. All Runite armour drops are now noted when dropped by the abyssal sire. King Sorvott IV's cat now recognizes your gender during Fremennik Isles quest. Runecrafting blood and soul runes now gives slightly more Runecrafting xp. Blood runes now give 23.8 xp per rune, soul runes now give 29.7 xp per rune. Drinking a cup of Guthix Rest tea will now be delayed in the same way as potions. Dragon warhammer special attack now drains NPC defence based off current stat and not base stat. The height mapping around the air obelisk and the Fountain of Rune has been changed slightly to reduce the likelihood of game crashes. The first content poll of the month of quality of life is now live! We've gone through all of the suggestions that have been sent our way and have chosen the suitable, popular suggestions that we've seen. All of the suggestions that you have sent us that are not seen in this poll are in the backlog awaiting the chance to end up on a future poll! Head to your nearest poll booth in game to vote. Have your say! That'll be on the way soon, don't you worry.